Today’s article takes a look at camping beds - the metal framed ones, in particular; we look at weight, assembly, comfort and practicality. Portability and comfort are two words that all camping equipment manufacturers try to shoehorn into one product, and all too often one is partially sacrificed to the detriment of the other. 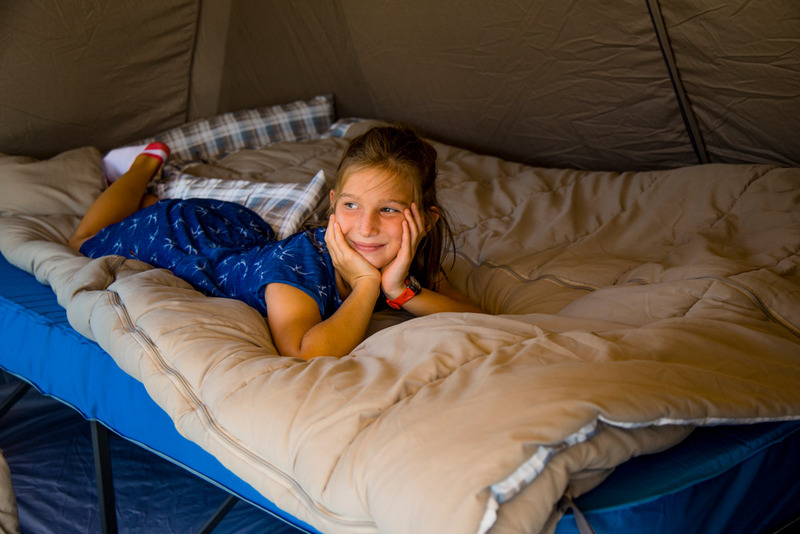 It is not often that a product is developed that is portable, comfortable and also adaptable, but camping beds are one item where these three factors are incredibly important if the product is to be fit for any type of camping trip. Many older people think of the metal framed camping bed first, as this was the only option before inflatable mattresses became widely available. This classic and simple design is still in use today, as it is practical, comfortable and portable. There are many of these types of bed on the market and all have slightly different constructions. Some have three legs, others have four, and the way in which the legs fit together and sit on the floor varies greatly. The great thing about these camp beds is the distance they put between your body and the ground. Camping mats and air beds are good for summer camping, but can be very cold in the winter as the cold ground reduces the air temperature in the mattress and comes through a foam mat quickly. Raised camp beds are great for camping all year round as they keep you warmer. The traditional construction of separate poles that fit together to form the frame is still used in some of the cheaper models, but technological developments in the design and construction of camping gear means that many of these camp beds now fold away for easy set up and pack down. They are more expensive, but they save time when setting up camp. The Slumber Campbed from Kampa is one of the more basic models and although it requires some assembly on site, it should not take any longer than 10 minutes to put together. The Vango Dormir XL Campbed, is a little more expensive but has won awards for its design and construction and is quicker to set up. It packs down small and features top and bottom elastic straps to aid the attachment of an inflatable mattress if needed. As its name suggests, the Dormir XL is slightly larger than a standard campbed at 215cm in length. Another great benefit to having a raised camp bed is that gear can be stored under the bed, making good use of the space inside your tent. This is also a bonus when using these camp beds for sleepovers and family visits when space is tight. At Christmas especially space is at a premium and if the kids can stash some of their presents under their beds that leaves more room elsewhere in the house. These camping beds are suitable for children and adults alike, and can be used for camping trips, sleepovers and family get togethers. There are even double models available for couples who find double air mattresses uncomfortable (which is certainly the case when there is a big disparity between the weights of both parties – one person will find the bed very hard and the heavier party will find it quite soft). Kampa have made a the prefect solution for this, creating their “Together” Double camp bed.. which now comes with a pillow. The ultimate comfort can now be shared! This double camp bed is great for couples, but due to the frame it does tend to preclude huddling together for warmth – couples who like to sleep close to each other may find an air mattress is better for them. Metal framed camp beds are not only comfortable to sleep on and easy to set up, they can also be quite lightweight compared to a bulky air mattress which also requires a foot or battery pump to inflate it. When you add in this extra inflation weight and the rigmarole of inflating it, and re-inflating when it loses air overnight, the metal framed camp bed is a low maintenance option, and there is no fear of a puncture rendering it unusable.